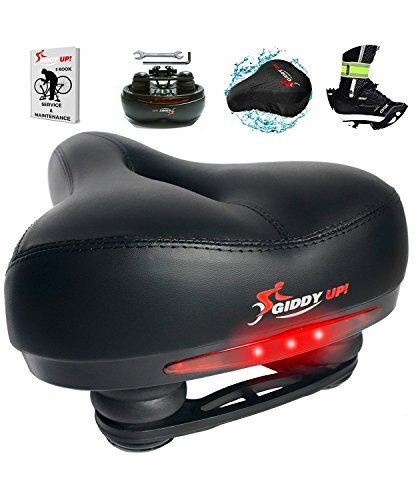 PREMIUM COMPLETE BUNDLE ---- WIDE BIKE SEAT WITH TAIL LIGHT including BIKE SEAT PROTECTION COVER, REFLECTIVE BAND and MOUNTING WRENCH. Whether you ride your bike to work, school, in the park, around the block or even off-road, day or night, you will find this seat the perfect choice. Giddy Up! Bike seat was designed to give you the most COMFORTABLE and SAFE ride as well as the best riding experience ever. SHOCK ABSORBING BALL, MEMORY FOAM MATERIAL and WATERPROOF ---- Looking for a smooth ride? The two rubber balls placed beneath the bicycle seat ensure absorbing the shocks coming from the bumps, potholes or any difficult terrain you are riding on, while the GEL FOAM will give you the comfort you seek. YOUR SAFETY COMES FIRST ---- Giddy Up! Bike seat comes with a LED TAIL LIGHT and a REFLECTIVE BAND to make your trip much safer when it gets dark. Use the protective cover to keep your seat in good shape during the time you are not using your bike. Forget about dusting and cleaning your seat from stains. Just remove the COVER and you are ready to go! UNIVERSAL FIT and EASY TO INSTALL ---- Giddy Up! Bicycle seat has a universal fit system which makes it easy to install on almost any type of bicycle, and it comes with all the INSTALL PARTS you need to start benefiting from the perks of the seat in the shortest time. If you have any questions about this product by Giddy Up!, contact us by completing and submitting the form below. If you are looking for a specif part number, please include it with your message.